The Bronze Age in Britain dates to between around 2000 BC and 800 BC and is characterised by a new form of burial tradition and the introduction and use of bronze metal. Individuals were now being buried on their own under a single barrow or mound, accompanied with metal objects and prestige items. Previous communal burials like the various chambered tombs of the Neolithic become a thing of the past. The Upton Lovell barrow group, which includes Upton Lovell G2a, dates from the Early Bronze Age, about 1900-1700 BC. The barrow is now badly damaged, but originally the mound covered one of the most unusual burials of the Early Bronze Age. I will turn next to describe some of the objects found in Upton Lovell G2a, as I believe that there are several objects in this collection which suggest that the person buried was an important individual, perhaps a shaman. Among them were four axeheads, including a prestigious battle-axe made of black dolerite. A circular polished, milky coloured stone was placed on his chest. At his feet was a collection of stones, which were probably a set of metalworker’s hammers and grinding stones, indicating that he was also a metalworker or even a goldsmith. Left: A stone rubber. Middle: A stone arrow-shaft smoother, a large whetstone and two hammers made from a broken stone axe-head. Right: Found on the chest of the man buried. A circular stone, with the upper and lower surfaces are polished, as is the v-shaped edge. The stone may be a working tool or a part of his religious paraphernalia. Which objects suggest a shamanic interpretation? For this week’s post, I have chosen 3 objects that really are amazing discoveries, that certainly suggest that shamanism was indeed a underlying aspect of prehistoric worldviews. The first collection of objects were found placed around the body within the barrow – a series of 36 pieces of worked bone. These bones each had a hole in it, and it seems likely that they were sewn to a cloak (going by their position in the grave). Another group of similar bones were found around his chest and neck – which could have been part of a necklace. 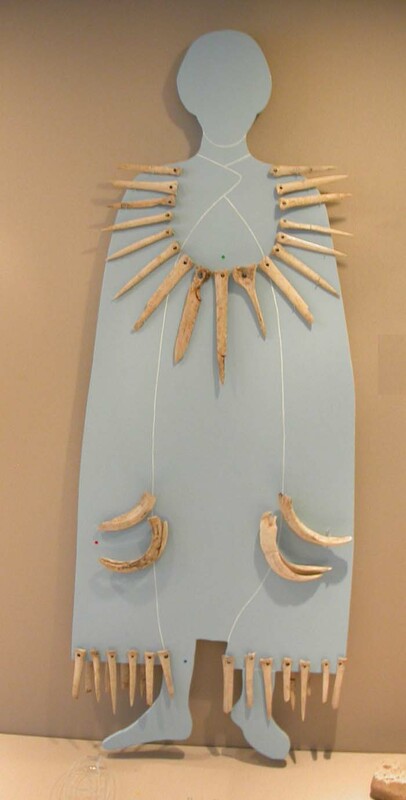 Four pierced boar’s tusks found by his knees may have decorated a pouch, and as I mentioned in the Mesolithic shamanism post: bones are added to a shamanic costume, human or animal, as they are connected to the symbolic death and rebirth experience. A costume is a powerful tool in the shamans toolkit; for one, it would provide protection. For some cultures who practise shamanism, shamans have more bones than a normal person, and since more bones meant more power, the shaman would paint or sew extra bones onto his costume in a practical form of wishful thinking. In other cultures, each bone represented a member of the clan, sometimes it was sewn on by each individual member. In this way, the shaman also felt protected by his entire clan. Sometimes the bones only represented the men, the women being symbolised by the “flesh” around the symbolic bones, meaning the part of the costume on which the bones were sewn. Nevertheless, bone symbolism is universally used on ceremonial costumes with many different meanings, making a single interpretation difficult. Within the Upton Lovell group of barrows there are others re-occurring objects that certainly point towards a shamanic worldview. These inlcude small miniture vessels, which have also been called incense cups or grape cups, such as the ‘Aldbourne’ example. 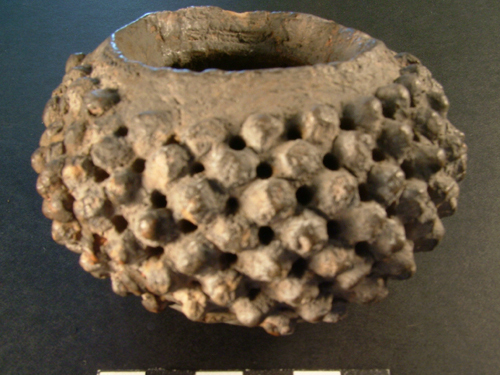 An example can be found here of a grape cup, this one was found at Upton Lovell G2a; it is also perforated. I’ve suggested elsewhere that these containers used to hold herbs or even psychoactive herbs like cannabis. It’s difficult to prove, but it does seem significant that the arrival of the ‘beaker’ cups holding alcohol, signifying an end to this particular culture. As to the truth of this we will never know, unless such substances can be analysised. The pots are decorated in a similar geometric fashion to the gold and bronze objects found in other graves, and also have holes on either side of the rim, for hanging up. The third object is a puzzle. It’s a gold bracelet, and has individual containers and each one can be opened independently. This object really does fascinate me, and the thought that they can be independently opened suggests that each cylinder was used to hold something, but what? Perhaps it may have been used as a shamanic trick – and filled with powders used in the shaman’s healing and performances. Imagine sitting around a fire and a puff of fiery colourful smoke emits from the flames – magic or trickery? We’ll never know, but by using our imaginations and clear ethnographic analogy, I think, we can get rather close to the truth! Currently working on the apotropaic re-use of neolithic artifacts in later periods. Really liked this and the previous blog about the neolithic – so good to see ideas moving forward after so long in denial about what the ancestors could have been up to. I’ve just found you, and think it’s great that you’re allowing imagination to come in, but seem to have much knowledge to weave it into. I hope I can keep up.